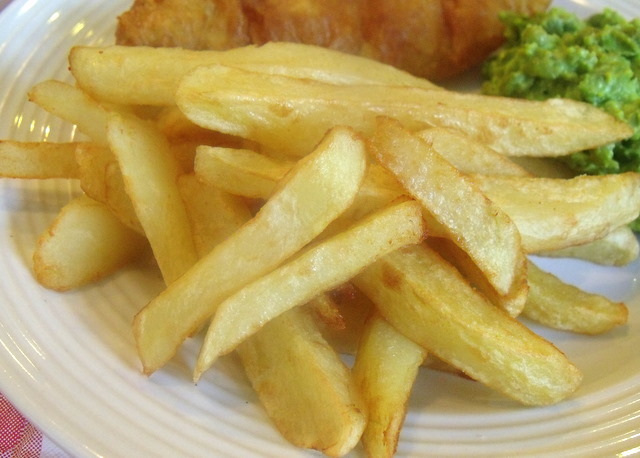 Irish chips are simply delicious, soft and tender on the inside and just slightly crispy on the outside. Their thick cut is perfect for absorbing the bitter-sweet goodness of malt vinegar drizzled on top. The trick to Irish Chips is parboiling the chips. Step 1 Peel the potatoes. Halve each potato lengthwise, then quarter it lengthwise. Cut each quarter in half lengthwise, then each eighth size piece in half again. Each potato should yield 16 long chips. Step 2 Add the sliced potatoes into a large saucepan and cover the chips with water. Season with salt. Bring the water to a boil, then reduce the heat and simmer for just 4 minutes. Step 3 Drain the chips into a colander and just let them sit there for 5 to 10 minutes to steam dry. Step 4 Pour the oil into a large dutch oven or deep frying pan, bringing the level to a little under half full. Heat the oil to 375 degrees Fahrenheit. Step 5 Lower some of the parboiled chips into the hot oil. Don’t put too many chips into the pan at once or they will stick together. Cook in 2 to 3 separate batches. Step 6 Cook them for 8 to 10 minutes until they are just turning golden. Step 7 Carefully remove them from the oil with a metal strainer, and place them on a plate covered with a paper towel to soak up any excess grease.